The way that Cathy and I celebrate Thanksgiving Day has changed over the past 38 years. 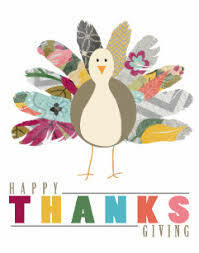 Some of the traditions have survived the test of time; such as eating too much and going around at the meal and saying what each of us are thankful for. When we were dating, we started off celebrating with both of our families; stuffing our faces at one house and then driving to the other family gathering to repeat the meal; and then waddle home under the influence of tryptophan. When our children were growing up, we added breakfast at our house. Afterwards, we watched the parade, dog show, and some of the Detroit game before heading to one of the parents’ homes to start the feasting. After watching the Dallas game, we watched the movie “Home Alone” before waddling home under the influence of tryptophan. As our children grew up, got married, and started having families (and in-laws) of their own, the way we celebrated Thanksgiving changed once again. Currently, we spend the afternoon at one of Cathy sisters’ homes with her side of the family and some of our children and grandchildren. We eat, talk, eat, play games (and pool) and watch both the Detroit and Dallas football games and then waddle home under the influence of tryptophan. 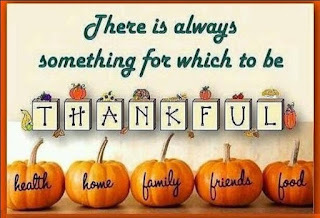 Thanksgiving is to be celebrated EVERY day...so no matter what day you are reading this, take time to give thanks to the LORD. 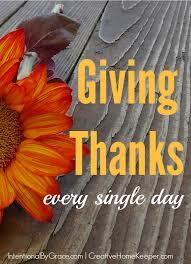 Don’t let this day be the only day that you say what you are thankful for. Thank the LORD for His provision (physically, mentally, emotionally, sexually, relationally, spiritually) and His protection (more times than you could ever imagine!). Thank Him for friends and family. Thank Him for your employment. Thank Him for vacation and times of refreshing. Thank Him for entertainment and sports and music and art. Thank Him for good times and bad; for richer and poorer, in sickness and in health, until death do you part from this earth. Thank Him even for that broken down, worn out vehicle that you wish you could afford to replace and yet still gets you through another day.